Korea’s Jiyai Shin shot a superb final round 4 under par 69 to win the 2016 Ladies Masters at Royal Pines Resort, defeating England’s Holly Clyburn by three shots. Shin had held the overnight lead by two shots from Clyburn and Sweden’s Camilla Lennarth, and the talented European pair piled on the early pressure. The 28 year old Swede made early birdies at the 1st and 3rd holes to join Shin in the lead at 10 under par while Clyburn herself made birdies at 3rd and 6th holes to make it a three way tie at the top, before Shin broke out of the tie with a birdie herself at the 6th to edge clear again. Two more birdies at the 8th and 10th holes saw the affable Korean take a 2 shot lead, however just when Shin seemed completely in charge she would falter with bogeys at the 11th and 13th, where she drove into the water to fall back into a tie for the lead with Lennarth, who had earlier birdied the 8th hole to get to 11 under par. Cheyenne Woods returns to Royal Pines Resort on the Gold Coast as a former champion of the Ladies Masters and should she reproduce the form that saw her sweep to victory in 2014, she will have a great chance of lifting the crystal trophy for the second time. The popular American, well-known as Tiger Woods’ niece, is making her third successive appearance in the tournament to be played from February 25-28. Born in 1990, ironically the same year as the inaugural Australian Ladies Masters, Woods has always looked the part on the golf course – stylish and oozing charisma. Tournament Chairman Bob Tuohy announced today the 27th Ladies Masters will be hosted by Royal Pines Resort on the Gold Coast from 25-28 February 2016. Victorian teenager Su Oh signalled her arrival as a world class player when she captured her first professional victory in only her second professional tournament in the RACV Ladies Masters at Royal Pines on the Gold Coast. With rounds of 69, 75, 72 and 69 Oh finished atop of the leaderboard at seven-under-par and three clear of 2009 champion Katherine Kirk (69) and England’s Florentyna Parker (69) and Charley Hull (73). As Kirk (69) and Englishwomen Florentyna Parker(69) walked to the clubhouse sharing the lead at four under, Oh made her winning move. The teenager reeled off four straight birdies at the 15th, 16th, 17th and 18th to finish in fine style. Outright fifth was Annie Choi, while six players finished at two-under-par including South African Lee-Anne Pace and leading amateur Rebecca Kay. With words of encouragement from her idol Karrie Webb who texted her messages of support before her final round, “I spoke to Karrie. I asked her: ‘what do I need to do, you’ve won this eight times’,” she smiled. Oh burst into tears of joy on the 18th green after tapping in her winning birdie putt, hugging her caddie father SG. “I got pretty emotional, didn’t I? That was a bit weird,” said the exuberant teenager. England’s Holly Clyburn, Charley Hull and South Korean Annie Choi share the lead after the wind swept day at the RACV Ladies Masters. It was a day where the RACV Royal Pines course won, with the best score of the day one-under-par 72 which was had by a handful of players. The leaderboard is jam packed with 17 players within four shots of the lead. The trio lead at four-under-par, Clyburn posted a one-over-par 74, while Choi and Hull had two-over-par rounds. The leaders will take a slender one shot lead into Sunday over Australian Su Oh (72), Norway’s Tonje Daffinrud (72) and second round leader Rebecca Artis. Artis took at three shot lead into Saturday struggled in the conditions and carded a six-over-par 78, however she is right in the mix. Local 16-year-old amateur Rebecca Kay finished her round in style with an eagle and got the biggest cheer from the crowd on the 18th. Kay (73) shares seventh place with Malaysian Michelle Koh (72) and Chinese Taipei Ssu-Chia Cheng (74) at two-under-par. October turned out to a month to remember for the talented South African as the week before she won her first LPGA title, she won her first national open, the Cell C Women’s South African Open in a playoff. It was the Pace’s ninth Ladies European Tour title. Tseng, who first started playing in the event as a 16-year-old amateur, has a superb record at the RACV Royal Pines Resort. 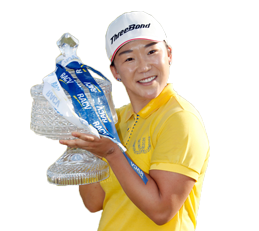 In seven appearances she has won once (2011) and posted another three top 5 finishes. Tseng has been a superstar of women’s professional golf since 2010. In 2011, the Taiwanese player was dominating the women’s game, she started the year off perfectly with back-to-back wins in the ISPS Handa Women’s Australian Open and Volvik RACV Ladies Masters. Following the two wins in Australia, she fulfil one of her dreams, to become No.1 in the World. Mr Tuohy acknowledged the on going support of Korean Golf Ball Manufacturer Volvik together with long standing event partners RACV, Tourism and Events Queensland, the Gold Coast City Council and Gold Coast Tourism. The question on everyone lips is 'can she do it again, for an incredible eighth time?. Yes, they are talking about Karrie Webb (OAM) arguably Australia’s best ever golfer. The Queenslander has won the Ladies Masters an amazing seven times and will be gunning for number eight when the ANZ RACV Ladies Masters gets under way at the RAVC Royal Pines Resort this Thursday. First round leader, Amanda Blumenherst, birdied her final hole of the day to join the early second round leader Ji-Na Lim in the lead at the completion of 36 holes at the ANZ Ladies Masters at Royal Pines on the Gold Coast. That pair enjoys a two shot break over Australians Karrie Webb, Katherine Hull and Tamie Durdin and Koreans Seo Yeon Ryu and Hee-Kyung Seo. US Open Champion In-Bee Park will join the 20th Anniversary celebrations of the ANZ Ladies Masters at RACV Royal Pines Resort on Queensland’s Gold Coast next March.